Is there any official documentation about the control layout logic for Nexgen panels (e.g., about the functions inside of NexgenContentPanel.uc)? I've been looking at existing plugin examples, and trying to follow how things work, but I'm struggling to understand it. Appreciate it Medor - do you happen to know which one might contain the Nexgen panel with these controls? 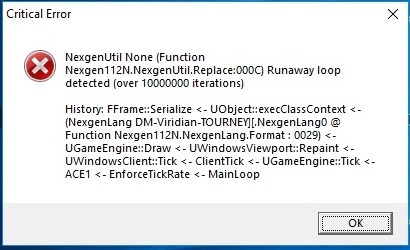 Only, earlier today I downloaded a selection of previous-version NexgenPlus files, and couldn't see anything related to bot spawning or removal. I had a look at a few of letylove's modified versions, and these do appear to contain the parts that I'm interested in, but unfortunately they're obfuscated and WotGrealExporter was only able to return partial source with a lot of "UnknownFunction" statements throughout. At some point I'll need to get more familiar with UI layout in Nexgen, but I'm trying to set things up quickly at the moment, and it'd save me a lot of time to use a pre-existing solution. Thanks Letylove49; things are working well now. Using the new mod SiegeIV_00... Nexgen puts its speed at 100 and does not even change by votemap, The correct speed of this mod is 125.
summing up, without the nexgen the speed normally works both by the mod ini and by the votemap. i have test with : SiegeUltimateRC7UB01.SiegeGI"
Only thing i need from nexgen is the HUD. Any people feeling the same way / with uscript knowledge that can pull this off? I was hoping to add this HUD only. Purely for the chat interface. Use ACE 1.0f this version work better . yes but Linux players will get kicked. "yes but Linux players will get kicked." Yeah, exactly. Better avoid doing so. By the way, new guy here. Whenever I'm taking a break from this particular interest, I'm usually found at home, feeding my Pomeranian with some treats and watching TV with my wife. And when we're not indoors, we would play catch in our backyard with our dog (though we had to secure one of those petsafe Stay+Play wireless dog fence, just so he wouldn’t stray far from our yard. Our neighbor had a weak wooden partition, and we once had an argument when the poor fella ended up on his lawn). Such a simple, yet, happy life. Cheers! Last edited by DoughHarry : 18th December, 2018 at 03:23 PM.